Photos and caption from the February 13th 1943 Brooklyn Eagle. The Columbia Broadcasting system and the British Broadcasting corporation launch an exchange series of 13 programs titled "Transatlantic Call: People to People" on Sunday from 11 to 11:30 a.m. on KGLO. This new series is designed to bring the two great nations closer together and to tell the people of each country how their friends and allies are living, working and fighting. 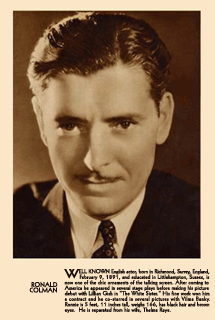 Ronald Colman, star of many Hollywood Screen Epics, acts as narrator on the American programs. Bob Trout, KGLO-CBS' correspondent in London, takes over the narrating job on the British broadcasts. The programs will be alternated weekly and presented simply and directly in order to provide a maximum of understanding to both audiences. They will mirror life as it is in various sections of both countries, trying to show the American and the Englishman exactly what the other fellow is like.
" People With Jobs" is the title of the first program, which will come from England. It originates in industrial North England and like all programs of the series from Great Britain is an actual on-the-scene broadcast. The American broadcasts to England will be dramatizations of conditions in different parts of the United States. They will originate in Hollywood. 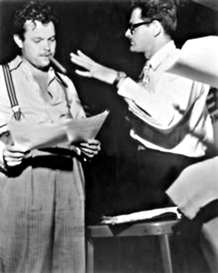 Norman Corwin, author and producer of many notable KGLO-CBS programs which have brought him recognition as one of radio's outstanding geniuses, writes, produces and directs the American programs. Geoffrey Bridson, top-notch BBC producer, will produce and direct the English programs coming westward, under the guidance of Laurence Gillialm, program supervisor of the series for the British Broadcasting corporation. Gilliam arrived in America last Tuesday. He has held several meetings with Corwin and CBS executives to work out final broadcast details. Norman Corwin, writer, director and producer of KGLO-CBS' "Transatlantic Call: People to People," turns the radio spotlight upon the nation's capital at war on the next broadcast from America to England, Sunday at 11 a.m., under the title "Washington, D.C."
The program's English listeners will get an intimate glimpse of capital activities as Corwin brings war workers to the microphone for interviews. A feature of the program will be an interview with Mrs. Hobart Brooks, 80 year old retired newspaperwoman, who knew the wives of 18 presidents, beginning with Mrs. Rutherford B. Hayes. Mrs. Brooks is a typical Washington "cave dweller," as those residents of the capital are called who retain their residences during successive and changng administrations. Corwin will also interview Mrs. Margaret Jotcham, Washington war worker, recently arrived at the capital from Winnipeg, Canada. She works in the British offices in Washington. Her husband, whom she has not seen in nearly three years, is a captain in the Canadian army overseas. With Guy della Cioppa assisting in the direction of the broadcasts, Corwin again assumes the role of narrator. The large garage room in the new armory will be used for the trans-Atlantic broadcast from the Inter-Tribal Indian Ceremonial on Sunday, August 15, it was announced today by representatives of the Columbia Broadcasting System who are here making preliminary arrangements for this program. Originally it had been hoped to stage the program from the stadium and to admit the public, but technicians after looking over the grounds, feared the noise from trains would interfere, and to be on the safe side decided to place the microphones inside. In the circumstances it will not be possible to admit the general public. The garage room will be draped with large Navajo rugs to help accoustic effects. The broadcast will be on the weekly program, "Trans-Atlantic Call," from 10:30 to 11 a.m. Mountain War Time, and will go to the entire CBS network and by short wave to the British Broadcasting Corporation which will re-broadcast it to the British empire. Cooperating with the Columbia Broadcasting crew here in preparation of the radio program have been F.W. LaRouche of the Navajo Indian service, in arranging contacts and supplying needed transportation. Similar assistance has come from Col. Clark Witman, commandant at the Wingate ordnance depot. Henry Chee Dodge, Navajo tribal chairman, has conferred with the radio representatives and is expected to have a part in the program, and Mr. and Mrs. Pete Gonzales of the Zuni reservation, and Henry Natewa, the Zuni governor, are cooperating. Through Governor Dempsey, the assistance of state police was offered in the matter of transportation. Hopes for the presence of the Las Vegas airbase band for the Ceremonial have been dashed by inability of the organization to arrange for transportation, and the music for the three days will therefore be supplied by the Zuni all-Indian band and by the Gallup municipal band. Word was received today that former Governor Ralph Carr of Colorado, a visitor in previous years, is planning to come again with members of his family. They will be guests in the home of Mr. and Mrs. John Kirk. "Transatlantic Call: People to People," the program broadcast on alternate Sundays from the United States and from England by the Columbia Broadcasting Company, will originate from Mason City's CBS station, KGLO, on Sunday, Oct. 3. Alan Lomax, writer and narrator, and Mrs. Lomax, research assistant, were in Mason City Thursday to start the interviewing of North Iowa residents in order to choose those who will appear on the half hour program, frm 11:30 a.m. to 12 noon. 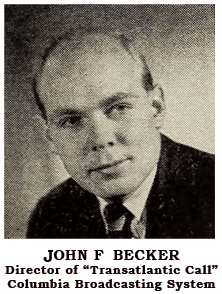 John Becker, producer of the program which is broadcast by short wave to England when it originates in this country, is expected to arrive here later this week. "Transatlantic Call" is a type of program new to this country although it has been used for some time in England where it is known as "the actuality program." It is designed to give the people an opportunity to tell their own story, Mr. Lomax explained. "It is a real democratic communication," the writer added. "It makes radio a vehicle of communication between ordinary folks. Our effort in producing it is always to subordinate the interviewer, to let him stay as much as possible in the background while the people tell their own story or talk it over among themselves." Mason City was chosen as a typical midwestern community and particularly because it is the center of the corn producing area, an area with a type of farming unknown to the British, Mr. Lomax pointed out. "Here farming is highly mechanized. Farmers have machinery, electricity--a radio crooner to lull the milk cows," he explained with a grin. "The British have never seen that kind of farming, just as they are unacquainted with corn. We'll have to call it maize for them." F.C. Eighmey, manager of station KGLO, suggested that North Iowans with boys in the service in the European area might be able to reach them by V-mail in time to let them know of the program so that they might listen in on their friends and neighbors. The program is from 11:30 a.m. to noon, central wartime, on Sunday, Oct. 3. NEW YORK, (AP)--Designed to give an indication of what the other fellow is like in wartime, a series of exchange broadcasts between England and America is to be conducted by British radio and CBS starting Sunday noon. They are listed as "trans-Atlantic Call: People to People." Altogether there will be 13 programs, the opener from England's industrial district to consist of on-the-spot pickups of war workers. Bob trout, aided by Billy Welcome of BBC, will run the show. 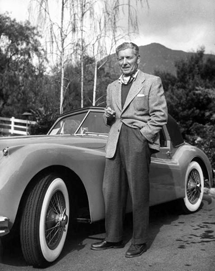 The American contributions, all from Hollywood, are to be dramatizations, with Ronald Colman as narrator, depicting conditions in various parts of the country. They will be heard on alternate Sundays. WATCH FOR "Transatlantic Call: People to People," collaboration of CBS and BBC, Norman Corwin producing for Columbia and Lawrence Gilliam for Britishers . . . Exchange series of seven b-casts from there, six from here. 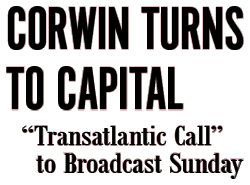 Trans-Atlantic Call A change in plans has switched the locale of the American part of the exchange series, Trans-Atlantic call, between CBS and British radio, from Hollywood to New York. The program opened last week from England, and the first New York contribution next Sunday will be a dramatization under the title of "New England." Norman Corwin handles this end of the broadcasts. A NEW SERIES of international programs, Transatlantic Call: People to People, started yesterday (Sunday, Feb. 7) on CBS here and the BBC in England. Series, conceived by CBS President William S. Paley during his London visit last year, is designed to bring about a closer relationship between England and America by telling the people of each country how their allies live, work and fight. Broadcast simultaneously on both sides of the ocean, the programs originate alternately in England and the United States. First program, People With Jobs, came from industrial North England; second will originate in Hollywood. 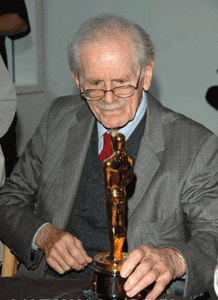 Norman Corwin will write, produce and direct the American programs. Geoffrey Bridson, BBC producer, produces and directs those from England, under the guidance of Lawrence Gilliam, director of features of BBC, now in the U.S. conferring with CBS executives about the series. 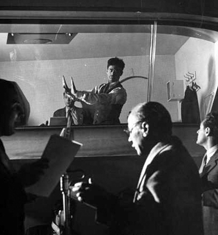 Bob Trout, CBS correspondent in London, is narrator of the programs coming westward; Ronald Colman will handle the same assignment on those going east from here. A change in plans has switched the locale of the American part of the exchange series, transatlantic call, between CBS and British Radio, from Hollywood to New York. The program opened last week from England, and the first New York contribution next Sunday will be a dramatization under the title of New England. Norman Corwin handles this en fo the broadcasts. America's first program of the new international exchange series, "Transatlantic Call" will be presented today at 12 noon over Columbia. Unlike the programs from Britain, those from America will take the form of dramatizations depicting Americans at war. America's first program of the new international exchange will be heard today. 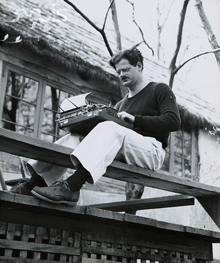 Norman Corwin has written and produced today's offering, which dramatizes Americans at war, under the title "New England." SUNDAY BRINGS CBS--12 Noon Trans-Atlantic Call, British Farmer. Second Show to Broadcast From Britain The people of Wilton, colorful borough of Great Britain's agricultural county of Wiltshire, are introduced to KGLO-CBS' American listeners on the second west-bound program of the international exchange series "Transatlantic Call: People to People." Titled "Country Town," the program is broadcast to America Sunday at 11 a.m. from the London studios of hte British Broadcasting corporation. This is the second of the 13-program series to come from London. The first broadcast from England, "People With Jobs," was heard two weeks ago, and last Sunday "New England" represented America's first contribution to the series. A.G. Street, long regarded as one of Great Britain's leading farmers, will assist Bob Trout, program narrator, taking over the duties performed on the first English program by Wilfred Pickles. Street, who also enjoys an enviable reputation as writer and story-teller, will introduce the people of Wilton to Bob, and Trout, in turn, will interview them before the microphone. While primarily an agricultural broaddcast, the program will not slight the workers of the Royal carpet factory, home of the famed Wilton carpets. Now they are making camouflage nets for anti-aircraft gun emplacements and field artillery hideouts and a specially treated felt, which is used as a substitute for rubber in the manufacture of airplanes. 12 noon--Transatlantic Call (WBBM): spotlighting the nation's capital at war; interviews with Mrs. Hobart Brooks, 80-year-old retired newspaperwoman who knew the wives of 18 presidents, and Mrs. Margaret Jotcham, Washington war worker from Canada. 12 noon--Transatlantic Call (WBBM): "Lambeth Walk." British Give Next Show in Series "Lambeth Walk," billed by the British Broadcasting corporation as a "typical slice of Cockney London" is the title of the next England-to-America broadcast on the current BBC-CBS exchange series "Transatlantic Call: People to People," Sunday on KGLO-CBS at 11 a.m. "Lambeth Walk" is a famous street in London across the Thames diagonally southeast from the British house of parliament. Old timers still talk of the good old days when the costermongers--push cart peddlers in New York--lined both sides of "Lambeth Walk" shouting their wares, cracking jokes, arguing and fighting. Natives of "Lambeth Walk" will be heard on the program, among them Amy Sands and, possibly, General Montgomery, a famous Lambethian. 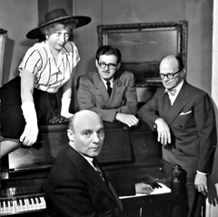 Amyl will probably tell of her talk with Wendell Willkie during his visit to "Lambeth Walk" after a German blitz. Amy says she gave Willkie some dates, two oranges and a couple of Spanish onions, got him on a bicycle and made him ride down "Lambeth Walk" past the stalls and little shops still remaining and past the rubble and wreckage caused by nazi bombs. 11 a.m.--Transatlantic Call (WBBM): "The Midwest: Breadbasket and Arsenal." "The Midwest -- Breadbasket and Arsenal," a synthesized picture of the Midwest of the United States, will be presented on "Transatlantic Call" today at 12 noon over Columbia. Wendell Willkie and Carl Sandburg will be guests. 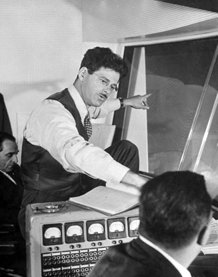 Norman Corwin's third program of the CBS-BBC international exchange series "Transatlantic Call: People to People," to be broadcast Sunday on KGLO at 11 a.m. will furnish a synthesized picture of the midwest of the United States under the title "The Midwest--Breadbasket and Arsenal. As in the two previous programs of the six to be presented from America, Corwin again will narrate as well as write, direct and produce. 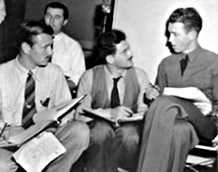 In explaining that the program will touch upon the participation of the midwest in the war, its history, its manners, its speech and taste, Corwin says: "The midwest is perhaps the only strategically important area of the entire united nations which is practically invulnerable to air attack because of distance and perimeter defense. It presents a number of striking aspects in this war, chief among which are its importance to the production of foodstuffs and weapons for the United States and her allies. "The great dairy industry of Wisconsin and Minnesota, the corn lands of Iowa and Nebraska, the wheat fields of Kansas and Missouri, and the lush farming country in Ohio, Indiana and Illinois contribute vastly to the breadbaskets not only of this country but of our allies. The greatest railroad center in the world is the cityof Chicago; the top city in tank and airplane production is Detroit; the steel works of Gary, Toledo and Cleveland--all are part of the midwest colossus."
. . . Norman Corwin, CBS program expert in writing and production, has suffered a relapse from a recent flu attack and has been forced to turn the job on his present transatlantic call series over to coworkers. 11 a.m.--Transatlantic Call (WBBM): from England; life in Rhondda Valley, Welsh mining district. WELSH MINING LIFE DESCRIBED Exchange Series to Originate in England Once again the microphone is moved to Great Britain in KGLO-CBS' international exchange series "Transatlantic Call: People to People" for a dramatization of war activities in Rhondda valley, famed Welsh mining district, Sunday from 11 to 11:30 a.m. The program will feature the miners and their families of Trearchy, small but bustling village in the heart of the Rhondda valley. Brought to a standstill by the depression of the last decade, Treorchy is prosperous again, once more a village of round-the-clock work, song, drama, welfare schemes, boys clubs, hospitals and bowling greens. Among the Rhondda valley natives taking part in the broadcast are Robert Rowlands, 34 year old miner, who has a son in the British army and another in the R.A.F. ; Thomas Hay, 35 years a miner, who has a son in the merchant navy and another in the R.A.F. ; and the Royal Welsh male voice choir. Others participating in the program will be a colliery official, welfare officer, four young miners from the Boys club, and an organizer of the children's feeding scheme. The program was written for the British Broadcasting corporation by P.H. Burton and T. Rowland Hughes of London. 11 a.m.--Transatlantic Call (WBBM): "A City in the American South at War," featuring Montgomery, Ala., written and narrated by Carl Carmer. 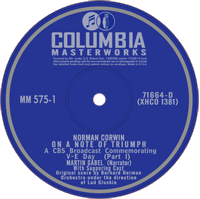 Because of the illness of Norman Corwin, "Transatlantic Call" today at 12 noon over Columbia will be written and narrated by Carl Carmer, noted author. "A City in the American South At War," is the title of today's program, which will originate from Montgomery, Ala.
Because of the illness of Norman Corwin, the next broadcast of the KGLO-CBS international exchange series "Trans-Atlantic Call: People to People" Sunday at 11 a.m. will be written and narrated by Carl Carmer, noted author, and produced and directed by Robert Lewis Shayon of the Columbia network staff. Carmer, who wrote "Stars Fell on Alabama," "Listen for a Lonesome Drum" and "The Hudson," is an authority on Americana and the folklore of the people of early America. Shayon, who is one of Columbia's top-notch producers and directors, puts on the famed KGLO-CBS "They Live Forever" series and currently produces and directs "Chips Davis, Commando." "A City in the American South at War" is the title of the Sunday broadcast, which will originate from Montgomery, Alabama. During the Civil War, Montgomery was the capital of the confederacy and today, with its all-out industrial and agricultural activity, it typifies the aggressive war efforts of the cities below the Mason-Dixon line. The program will give British listeners--and Americans--a picture of life in Montgomery under war conditions. It will present people from Montgomery for first hand reports. The choir of the famous Tuskegee institute will be heard. 11 a.m.--Transatlantic Call (WBBM): a story of Hull, England. 'Front Line City' to Be Next Topic for Airing The nazi hit-and-run town of Hull on England's Yorkshire coast is the "Front Line City" of the next England-to-America broadcast, Sunday at 11 a.m. on KGLO-CBS' international exchange series, "Transatlantic Call: People to People." Bob Trout, CBS London correspondent, will act as narrator with the assistance of Wilfred Pickles of the British Broadcasting corporation. The broadcast is intended to give listeners a true picture of life in a city right under the guns of Germany. During the broadcast Trout will interview men in the street, housewives, shop-keepers, school children, war plant workers and fishermen. Hull is a fishing town but the nets have been dried and packed away for the duration. The fishing is still good off the harbor of Hull and the fishing fleet leaves on schedule just as it did during more peaceful days. But now, the "pulpits" off the bows of the boats have been replaced by anti-aircraft guns; the "wells" of the boats which used to cradle the catch, now carry 200-pound cans of dynamite for Hitler's subs and the fishing "out-riggers" support heavy steel cables rather than linen lines. The fishing fleet of Hull fishes now for German mines and under-sea U-boats. 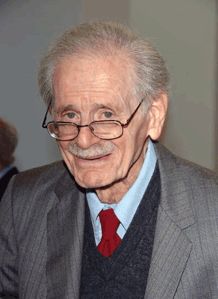 Corwin to Rest NORMAN CORWIN has given up writing and directing the CBS-BBC Transatlantic Call series and will leave New York shortly for a prolonged rest, necessitated by a pneumonia attack from which he has failed to recover fully. Earl McGill, CBS producer-director, will handle the next broadcast of the series, to originate in this country, with Clifton Fadiman, literary critic and m.c. of NBC's Information Please, serving as writer and narrator. It is not known whether the pair will take over subsequent programs on a regular basis. The weekly series, originating alternately in the United States and Great Britain, last Sunday featured Bob Trout, CBS London correspondent, describing the town of Hull, on England's Yorkshire coast. 11 a.m.--Transatlantic Call (WBBM): typical Times Square folk, with Clifton Fadiman as narrator. C. Fadiman to Narrate, Pen Next in Series Clifton Fadiman, author, lecturer, literary editor and critic of The New Yorker magazine, and impresario of the radio program, "Information Please," will write the next America-to-England program of the international exchange series "Transatlantic Call: People to People" and act as narrator on the KGLO-CBS broadcast Sunday at 11 a.m. "Times Square" is the title of the program, which will depict the world's metropolis, New York, at war. Here at Times Square, often referred to as the "cross-roads of the world," people of all nations, in and out of uniform, rub elbows as they hurry along on business or in the pursuit of pleasure. No more do the great advertising signs, theater marquees, and hotel lights turn Times Square nights into day. Times Square is dimmed out. Broadway isn't "The Great White Way" now--but Broadway will always be Broadway. Earle McGill, dean of CBS producers and president of the radio directors guild, will produce and direct the program. McGill has produced and directed many of Columbia's most important network programs and currently produces, among others, "Report to the Nation." 11 a.m.--Transatlantic Call (WBBM): Edinburgh to America. "A Visit to Edinburgh" will be broadcast on the exchange series, "Transatlantic Call," today at 12 noon over Columbia. 11 a.m.--Transatlantic Call (WBBM): San Francisco at war. Titled "San Francisco," the broadcast of the international exchange series "Transatlantic Call: People to People" from America to England tells the story of the great west coast city at war on KGLO-CBS Sunday at 11 a.m. The program is produced by William Spier, and written by Everett Tomlinson and Chet Huntley. 8:00 WEEI -- Transatlantic Call. Thomas Freebairn Smith, narrator; Ernest J. Ingold, John Cuddy, guest speakers. 11 a.m.--Transatlantic Call (WBBM): farming in England. Farmers of Great Britain Air Troubles Farming under blitz conditions is described by agricultural workers of southern England in the Sunday England-to-America broadcast, entitled "Front-Line Farmers," to be heard over KGLO-CBS at 11 a.m. This program is another in the BBC-CBS international exchange series "Transatlantic Call: People to People." The program has been arranged by Joan Littlewood and G.D. Bridson of the British Broadcasting corporation. Bob Trout, of Columbia's London staff, acts as narrator. Marshal Goering's luftwaffe has spent much of its time and expended many of its biggest bombs on the city of Chichester and the fertile fields which encompass it for miles. Because of its proximity to the nazi air bases on the channel coast, Chichester and its brood of farms has not yet enjoyed the neglect with which the nazis have treated London and other more inaccessible communities during the last year. The farmers of the Chichester area till the soil and plant the crops with a weather eye skyward. Many of them will be brought to the BBC microphone to tell their stories of blitzkrieg farming. 11 a.m.--Transatlantic Call (WBBM): San Antonio at war. "Call" Series Comes From Texas Sunday "Transatlantic Call, People to People," KGLO-CBS' international exchange series, comes from the south central area of the United States Sunday, at 11 a.m. in its next radio dramatization of regional wartime activities. From station KTSA, American and British listeners will hear the people of "San Antonio, Heart of Texas." The program is produced and directed by Earle McGill and written by Alan Lomas, Texan folklorist and native of the lone star state. The 25 year old Lomax is a veteran of Columbia's "American School of the Air" and former assistant of Archibald MacLeish, librarian of congress, in charge of the archives of American folk song. 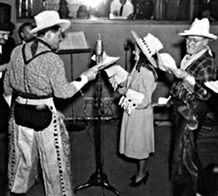 During the broadcast, radio visits will be made to the Alamo, Kelly field, America's wartime flying center, the old Buckhorn saloon, now a tourist showplace and to Haymarket plaza in the city's Mexican quarter. 11 a.m.--Transatlantic Call (WBBM): "The Thames at War." OFFER SAGA OF RIVER THAMES "Call" Series to Tell Story of Gallant Boats Reich Marshal Goering's luftwaffe lost the battle of London and with it all hope of throttling war traffic on the River Thames. The story of this epic struggle of ships against planes is told Sunday on KGLO-CBS at 11 a.m. on "Transatlantic Call: People to People," international exchange series of programs broadcast jointly and on alternate weeks by Columbia and the British Broadcasting corporation. "The Thames at War" is the title of the Sunday program. It has been arranged and written by BBC's Marjorie Banks who will also direct the broadcast. Bob Trout, CBS London correspondent will serve as narrator and interviewer. During the dark days of the battle of London, the nazi air squadrons rained bombs upon the plodding ships in the Thames as they struggled to make port with needed guns, ammunition and food. The Thames estuary, teeming with wartime surface traffic from giant convoys to tiny sailing skiffs, was under frequent bombing attack by the nazi air fleet. The men who kept the tonnage flowing to the port of London will be interviewed by trout. 11 a.m.--Transatlantic Call (WBBM): trip to Maine. 11 a.m.--Transatlantic Call (WBBM): "Men from North Africa." CBS Assigns 3 to Handle Joint Program With BBC TO HANDLE broadcasts of the BBC-CBS series, Transatlantic Call: People to People, originating in the United States, CBS has assigned a crew of three, composed of Alan Lomax, who will write and edit material; John Becker, director; and Stamford Mirkin, who will do research on those cities from which the program is to originate. 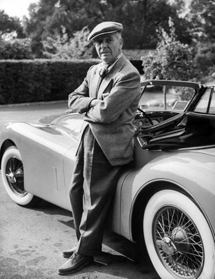 In announcing the assignments, Douglas Coulter, CBS director of broadcasts, indicated the series might be continued beyond the end of June, date originally set for the last broadcast. Allied Heroes Tell Stories of N. Africa American and British heroes of the Tunisian campaign describe the part they played in the great allied victory on "Men From North Africa," next England-to-American program of the CBS-BBC international exchange series "Transatlantic Call: People to People," heard over KGLO-CBS Sunday from 11 to 11:30 a.m. Included among the American soldiers scheduled to participate in the broadcast is Sgt. F. W. Tate, of Detroit, Mich. Tate is radio operatorof a liberator bomber which has made many raids on Naples, Palermo and other Italian and Sicilian war centers. Prior to the rout of the axis, Tate's bomber operated out of Tobruk in raids over Hizerte, Sousse, Tunis and Stax. Although the plane has been riddled with bullets on several occasions no member of her crew has been wounded. Tate was an automotive engineer in Detroit before joining the air force. Among the British soldiers and sailors appearing on the program are Lt. Com. Osbourne, skipper of a rescue tug; Sgt. Levio, of the royal engineers, who will tell about mine planting and lifting, and Sgt. Pemberton, veteran of Dunkirk and the North African campaign. EARL McGILL, CBS producer-director has been named producer of the CBS-BBC international exchange series Transatlantic Call: People to People, replacing Norman Corwin, who is still on the West Coast recuperating from an illness. The program has been extended through the summer, and is now heard Sunday at 12:30-1 p.m.
"Call" Series to Continue for Summer Savannah, Ga., picturesque and storied southern seaport, provides the setting for the next America-to-England broadcast on the CBS-BBC international exchange series "Transatlantic Call: People to People" over KGLO-CBS Sunday at 11:30 a.m. The Savannah broadcast launches another extension of the series which insures its continuation through the coming summer. The time is also changed. The new time is 11:30 to 12 noon instead of 11 to 11:30 a.m. Earle McGill has been producer of the series which has been without the services of Norman Corwin who was forced to step out of the programs because of illness. Corwin is now on the west coast recuperating. Coincident with the appointment of McGill as producer it was announced that John Becker will direct the programs in the future and the script will be written by Alan Lomax. The schedule for summer programs from America on alternate weeks follows: June 20, Duluth, Minn., from station KDAL. July 4, Philadelphia, Pa., from station WCAU. July 18, Spokane, Wash., from station KFPY. Aug. 1, Albuquerque, N.M., from station KGGM. Aug. 15, Charleston, W.Va., from station WCHS. REFUGEES TELL OF EXPERIENCES To Speak on CBS-BBC Exchange Show Sunday A 17 year old Polish boy who was blown off a roof during a nazi raid on Warsaw . . . A Belgian soldier who escaped from Brussles to Paris in 1940 and then to Spain where he organized a Belgian youth camp . . . A Jugoslav correspondent who escaped an Italian prison . . . These and others describe their escapes over KGLO-CBS' "Transatlantic Call: People to People" broadcast from England, Sunday at 11:30 a.m. The program, titled "Fighters of United Nations," is another in the current BBC-CBS exchange series originating alternately in America and England. The American participant on the program is Major Jerstad of Racine, Wis., who describes bombing missions of hte 8th U.S. army air force. Citizens of united nations who contribute musically to the program include: A norwegian choir of merchant mariners, eight singers from a Greek destroyer, a vocalist from a Dutch submarine, a Polish army choir, a Czech baritone singing songs of his native land, and a Newcastle, England, men's choir. 43-06-20 Nebraska State Journal - "People to People" A stirring radio picture of Duluth, Minn., typical melting pot of persons of United States parentage, is given listeners on "Transatlantic Call: People to People" Sunday, June 20. (KFAB, 11:30 p.m. The program, another in the current BBC-CBS exchange series, originating alternately in America and England, pictures Duluth as a city moulded fy fundamental Americanism--where persons of different nationalities live without hatred and prejudice. Among the Duluthans to be heard are Mrs. Anna Fuhr, editor of the local Norwegian paper, "The Duluth Scandinav"; John Crocker, a Cornish miner; and Captain Clifford Polkinghorne, a marine superintendent, British ministry of war transport, Superior, Wis.
Lieut. Burgess Meredith, narrates a tour of historic Hyde Park on "Transatlantic Call: People to People" Sunday, June 27. (11:30 a.m. KFOR). The program is another in the CBS-BBC exchange series originating on alternate Sunday in Great Britain and the United States. An employe at Hyde Park for the past sixty years, Riding Master Angell will recall the time when only Queen Victoria with her Lords and Ladies, and grooms and footmen used the park's historic bridal path, Rotton Row. Now, he explains, anyone may ride there. Also on the program is Lieut. Simon of Hartford, Conn., now with the American forces in England. He tells how the American soldiers ride horseback and play softball in Hyde Park; and describes his reactions to typical Hyde Park soap-box orators. Wendell L. Willkie will give a message to the freedom-loving nations of the world and Frederic March will appear in a drama reflecting America's early fight for liberty in a special broadcast at 1 p.m. over WBBM. 1 p.m.--Transatlantic Call (WBBM): Spokane and the war. 1 p.m.--Transatlantic Call (WBBM): life in Cwmgiedd, Wales. Life in Welsh Mine Town to Be Told on "Transatlantic Call" Life in Cwmgiedd, a Welsh mining community, is described on KGLO-CBS' "Transatlantic Call: People to People" broadcast Sunday at 11:30 a.m. The program is another in the CBS-BBC exchange series originating on alternate Sundays in England and the United States. Citizens of Cwmgiedd recently became movie performers, when the Crown Film unit produced "The Silent Village," story of Lidice, the Czechoslovakian town wiped out in vengeful reprisal by the nazis. Inhabitants of the Welsh mining village were invited to take leading roles in the production. The villagers tell how participation in the film brought home the horror of life in nazi-dominated territories. A Cwmgiedd miner delivers a stirring speech vowing vengeance in the name of all free workers. CBS Editors Due Here Next Week To Plan Program - M. L. Woodard, secretary of the Inter-Tribal Indian Ceremonial, said today he had received word that the editors who will prepare the world wide broadcast of the Ceremonial program on August 15 will arrive in Gallup next week to start work. Woodard received the word in a telephone conversation last night with Alan Lomax and John Becker from Charleston, W. Va., from where next Sunday's "Trans-Atlantic Call--People to People" will be broadcast. Last Sunday's program came from Wales, Britain and the United States taking charge of the program on alternate Sundays. Mr. Merkin will arrive on Monday, Lomax on Wednesday and Becker on Thursday to prepare the script for the program "The Contribution of American Indians to the War." The program will have 15 separate spots, or features, including music, talks and interviews. It will be broadcast Sunday, August 15 from 10:30 to 11 a.m. mountan war time over the Columbia Network and the Canadian Broadcasting System, and shortwaved to the British Broadcasting Company. KOIN--CBS Correspondent Larry Lesueur gives a picture of a North Sea port of the British Isles on "Transtlantic Call." He will interview crews of ships leaving that place. LT. MEREDITH TO NARRATE "CALL" From Britain Lt. Burgess Meredith, former stage and screen star now with the air transport command, U.S. army, narrates a tour of an "Anglo-American Small Town" on KGLO-CBS' "Transatlantic Call: People to People," Sunday at 11:30 a.m. The broadcast is another in hte CBS-BBC exchange series originating alternately in England and the United States. The locale is a midland arket town in Great Britain which has no railway station, no cinemas and only 2 streets, but whose contribution to the war effort is so important that its name cannot be revealed. Meredith tells the story of the town's invasion by munitions workers, the United States 8th army air force, and Britain's WRENS, ATS and WAAFS. Among typical town workers he interviews are Gwynne Morris, a Welsh girl,working in a shell-filling factory; May Brown, 20 year old forewoman; WREN Gale, former bank clerk on Channel Island who escaped when the nazis invaded; and Lance Corporal Brown of ATS, a height finder. Americans on the program include Colonel Holland, camp commandant; and WAC Lt. Polly Abell of Spokane, Wash.
MARY GARDEN, celebrated diva, once director of the Civic Opera company, speaks from her birthplace in Scotland, on the CBS-BBC exchange program "Transatlantic Call: People to People" Sunday on KGLO-CBS at 11:30 a.m. Heard with Miss Garden is Pvt. Karvin A. Wahl, who, oddly enough, is from Aberdeen, S. Dak. He is now serving in Britain. Others on the program are Lady MacRobert, who lost 3 sons in the RAF; Jean Allardyce, a student at Aberdeen university, whose vacation is spent working in the harvest firlds; and Pvt. Gladys Rae, an anti-aircraft gunner of the ATS. "Transatlantic Call: People to People," comes from Gloucester, Mass., with members of the CBS staff interviewing residents of that famous fishing town Sunday on KGLO-CBS at 11:30 a.m.
A bunch of West Point cadets who've already been under fire and returned for specialized training, Sgt. John M. Willig, reporter on the North African "Stars and Stripes," Lois Madden, who rows or skates after spent bullets on the Remington Arms Bridgeport proving range, and Elaine Ward, the model who won't date a boy unless he buys a $500 War Bond First . . . Colorful Cornwall, the scene of Sunday's "Transatlantic Call," the BBC-CBS collaboration. THE HIGHLY mechanized production-line technic of the American farmer at war is presented on KGLO-CBS' "Transatlantic Call: People to People," Sunday at 11:30 a.m. The program, 1 of a weekly series heard alternately from England and the United States, originates from the KGLO studios in Mason City and is built around a day on the farm. The North Iowa farmers grudgingly take time out to tell American and English listeners how they have increased production and, in some instances, have successfully grown things previously imported from the Philippines and other areas now ravaged by war. The Iowa country is the richest farming land in America and the farmers expect a bumper crop this yaer. Their highly mechanized type of farming might well be compared to an assembly line in any war factory. One farmer near here reveals in an interview how he uses a radio in his barns to make the cows give more milk; another describes his machines that milk cows, pick corn, feed stock and churn butter. FOR THE benefit of those who missed KGLO's origination of "Transatlantic Call: People to People," last Sunday morning on CBS and BBC, the program will be played back by transcription Thursday from 7 to 7:30. The station management has received many requests for the play-back as well as myriad numbers of congratulation as to the quality of the show's production and content. 11:30 a.m.--Transatlantic Call (WBBM): "Sunday at Home," cross-section of people of Soho, London, and lower east side of New York. PITTSBURGH, melting pot of men and metals, where steel sinews of war are forged amid the changing of machines and the babble of many tongues, is the locale of the CBS-BBC exchange program "Transatlantic Call: People to People" Sunday on KGLO-CBS at 11:30 a.m.
STARTLING contrasts between British and American school life are delineated for KGLO-CBS and BBC audiences in a half-hour split broadcast of "Transatlantic Call: People to People" Sunday at 11:30 A.M. The American half of the program originates at the WEEquahie high school in Newark, N.J. Named after an Indian chief, the school was founded in 1933 and serves 2,600 students of many races and nationalities. The British portion of hte broadcast is devoted to the Manchester grammar school founded by the famous Hugh Oldham, Bishop of Exeter, in 1515. 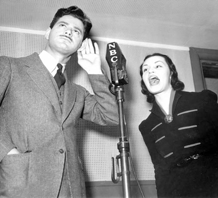 11:30 a.m.--Transatlantic Call (WBBM): "The Road to Dover," broadcast from London. 11:30 a.m.--Transatlantic Call (WBBM): from Newburgh, N.Y., center of war industry, once Revolutionary headquarters of George Washington. 11:30 a.m.--Transatlantic Call (WBBM): from old Roman wall in Northumberland, England. The old Roman wall in Northumberland, England, built in 120 A.D. as a fortification against the Scots, will be the locale for "Trans-Atlantic Call" this orning at 11:30 over Columbia. Focusing on people living along the wall in towns with picturesque names, the broadcast brings out cenurited traditions, vivid descriptions of the beautiful countryside and much color about the residents themselves. 11:30 a.m.--Transatlantic Call (WBBM): from Tampa, Fla.
EDWARD R. MURROW, chief of Columbia's European correspondents, appears on the CBS-BBC exchange series "Transatlantic Call: People to People" Sunday on KGLO-CBS at 11:30 a.m. Originating in London, the program features interviews with recently exchanged prisoners of war from Germany. KOIN -- The Tennessee Valley Authority project is described for American and British audiences on Transatlantic Call at 10:30 A.M. The quaint Christmas pantomime, traditional entertainment in English families at Yuletide, is delineated from Britain for American listeners on CBS-BBC exchange series "Transatlantic Call: People to People," Sunday, Dec. 19. The program originates in Yorkshire. 11:30 a.m.--Transatlantic Call (WBBM): British children in U.S. and Canada talk to their parents in England. 12:30 WEEI -- Transatlantic Call, "Children Calling Home." 11:30 a.m.--Transatlantic Call (WBBM): Milton Bacon tells whaling lore of New Bedford, Mass. THE STAFFORDSHIRE potteries in England's "White Country"--source of most of Britain's porcelain, china and earthenware--is the locale of the CBS-BBC exchange series "Transatlantic Call: People to People" Sunday on KGLO-CBS at 11:30 a.m. "White Country" pottery workers discuss their craft traditions, peculiar trade dialect, their wartme difficulties and their post-war plans. 12:30 WEEI -- Transatlantic Call, from Boston. 11:30 a.m.--Transatlantic Call (WBBM): from Pennsylvania Dutch country, near Lancaster. Lancaster, Locale Of Transatlantic Broadcast Sunday Lancaster and surrounding countryside, one of America's richest farming areas, will be the locale of the CBS-BBC exchange program, "Transatlantic Call--People to People," Sunday, January 30. This broadcast, which is carried by the entire Columbia network, is relayed to London, where it is also broadcast by the British Broadcasting Company. In order to make the program availablel, WHP, Harrisburg, has re-arranged its schedule for Sunday and will broadcast the feature locally at the time of its origination, 12:30 to 1 p.m. "Transatlantic Call--People to People" originates one week in America, and is designed to give the people of both countries a complete picture of these two great Nations at war, as well as an idea of what the othre is doing to bring the war to quick and decisive end. Milton Bacon, narrator on the program, will tell the people of Great Britain about the Mennonites, who settled Lancaster county in 1688, and will interview some direct descendants of these early pioneers. The story and descriptions of the distinctive culinary creations--shoo fly pie, cup cheese, smear case, schnitz pie and meat puddings, for which this regionis famous, will also be told on the program, included in this will be the history of the people who created them. The people of England will visit a typical country auction on this program, where everything from a door jamb to a house is sold; they also will hear Milton Bacon interview a dairy farmer, a tobacco grower, chicken and celery raiser, pretzel vender and a tomato grower, who invented a tomato picker with a radio attached to alleviate his boredom while working. 4-02-06 Wisconsin State Journal - 11:30 a.m.--Transatlantic Call (WBBM): Glasgow, Scotland is pictured for British and American listeners. Sunday Afternoon: First anniversary of the CBS-BBC "Transatlantic Call." 44-02-13 Wisconsin State Journal - 11:30 a.m.--Transatlantic Call (WBBM): from Wilmington, Dela., America's "Chemical City." 44-02-20 Wisconsin State Journal - 11:30 a.m.--Transatlantic Call (WBBM): originates from Liverpool, England, with men and women connected with Liverpool shipping. 44-02-27 Wisconsin State Journal - 11:30 a.m.--Transatlantic Call (WBBM): from Cambridge, N.Y., and Rugby, England. TWO country editors, one British, the other American, are presented in a characteristic picture of wartime rural journalism on the CBS-BBC international exchange series "Transatlantic Call: People to People" Sunday on KGLO-CBS at 11:30 a.m. On the American half of the program, Charles John Stevenson, editor and publisher of the Washington County Post, Cambridge, N.Y., is interviewed by narrator Milton Bacon. 44-03-05 Wisconsin State Journal - 11:30 a.m.--Transatlantic Call (WBBM): a picture of "Springtime in Devonshire," from London. 44-03-12 Wisconsin State Journal - 11:30 a.m.--Transatlantic Call (WBBM): from Key West, Fla.
44-03-11 Mason City Globe-Gazette - KEY WEST, Fla., the southernmost point in the United States, is the locale of the CBS-BBC exchange series "Transatlantic Call: People to People" Sunday over KGLO-CBS at 11:30 a.m. The program, originating at a point where both the Gulf of Mexico and the Atlantic ocean are visible, is written by Allan Sloane and narrated by Milton Bacon. 44-03-19 Wisconsin State Journal - 11:30 a.m.--Transatlantic Call (WBBM): from "Black Country," manufacturing area of England; Ted judge, brother of Jack Judge, composer of "Tipperary," will sing sequel, It's A Long Way No Longer." 44-03-26 Wisconsin State Journal - 11:30 a.m.--Transatlantic Call (WBBM): from Memphis, Tenn., for picture of "land of cotton." 44-04-02 Wisconsin State Journal - 11:30 a.m.--Transatlantic Call (WBBM): "New London Markets," broadcast from London, England. 44-04-09 Wisconsin State Journal - 11:30 a.m.--Transatlantic Call (WBBM): story of New England in maple sugar time. 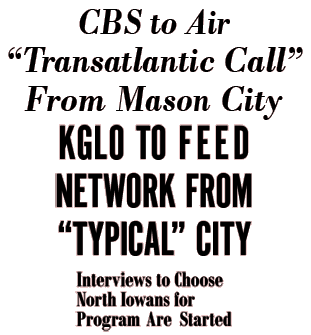 44-04-08 Mason City Globe-Gazette - THE COLOR and romance of maple syrup time in New England is brought to British and American listeners on the CBS-BBC exchange program "Transatlantic Call, People to People" Sunday over KGLO-CBS at 11:30 a.m. Originating in the new studios of WCAX, Burlington, Vt., the program centers about a typical New England farm faily as its members collect the sap and prepare the syrup. 11:30 a.m.--Transatlantic Call (WBBM): department store buyers here and in England compare notes on wartime merchandising. 11:30 a.m.--Transatlantic Call (WBBM): "A Doughboy Looks at Dickens," broadcast from London. THE SPIRIT of London in the mid-18th century, and the manner in which that spirit still lives, is the theme of "Dickens' London" on the CBS-BBC exchange series "Transatlantic Call: People to People" Sunday on KGLO-CBS at 11:30 a.m. John Hooley, assistant traffic manager for BBC in New York, now visiting England, takes the part of a typical American in London and is the narrator on his tour of the city's old landmarks. 4-04-30 Wisconsin State Journal - 11:30 a.m.--Transatlantic Call (WBBM): housewives in America and England tell how they have adapted themselves to the war. 44-04-29 Mason City Globe-Gazette - THE WAY in which American and British housewives have adapted themselves to the war is told by the wife of a U.S. factory worker and the spouse of a London pilot, on the CBS-BBC exchange program "Transatlantic Call: People to People," Sunday at 11:30 a.m. Milton Bacon is narrator of the program and Leon Levine is producer. 44-05-07 Wisconsin State Journal - 11:30 a.m.--Transatlantic Call (WBBM): describes the circus as "the great American institution." 11:30 a.m.--Transatlantic Call (WBBM): "The Country Barber," in Britain and America. 44-05-21 Wisconsin State Journal - 11:30 a.m.--Transatlantic Call (WBBM): from royal English town of Windsor and River Thames. 11:30 a.m.--Transatlantic Call (WBBM): from Hannibal, Mo., birthplace of Mark Twain, and Chippefield, Hertfordshire, England, discussing baseball and cricket. 11:30 a.m.--Transatlantic Call (WBBM): from Great Falls, Mont., describing spring roundup of cattle. THE spring roundup of cattle in Montana is documented for B ritish and American listeners on the CBS-BBC exchange series "Transatlantic Call: People to People" Sunday on KGLO-CBS at 11:30 a.m. Milton Bacon is narrator of the program which will present girl cow punchers who have replaced men on the ranches, and delineate life on the ranges during the branding season. 11:30 a.m.--Transatlantic Call (WBBM): two country doctors in small towns of England and America compare their wartme duties. 11:30 a.m.--Transatlantic Call (WBBM): shows current and prewar life in London borough of Bermondsey. CURRENT and prewar life in the London borough of Bermondsey, where local tradition decrees that all boys on reaching 18 become stevedores on the 3 mile stretch of docks, is delineated on the CBS-BBC exchange series "Transatlantic Call: People to People" Sunday on KGLO-CBS at 11:30 a.m. Pre-war life in the borough, whose area includes the famous London bridge, is described by a Mrs. Reeve, wife of the licensee of the "Angel Inn," and by Mrs. Rosina Neale, whose husband formerly ran the hostelry "Bug and Blanket." 11:30 a.m.--Transatlantic Call (WBBM): Maine lumberjacking. 11:30 a.m.--Transatlantic Call (WBBM): London bobby, Chicago cop compare notes. 11:30 a.m.--Transatlantic Call (WBBM): from Forest of Arden, setting of Shakespeare's "As You Like It," with American soldier questioning Britons living there. KOIN -- The Forest of Arden, setting of Shakespeare's "As You Like It,' is the scene of the CBS-BBS exchange series, Transatlantic Call. Among those to be heard on the program are Robert Atkins, director of the Stratford Memorial Theatre, which presents yearly a season of Shakespeare plays, and members of the current company. 11:30 a.m.--Transatlantic Call (WBBM): presents English chemist shop and American drug store in contrast. 11:30 a.m.--Transatlantic Call (WBBM): from ship-building port of Portland, Me. 11:30 a.m.--Transatlantic Call (WBBM): from Lancashire, England, telling of traditional English midsummer holiday, "Wake's Week." 11:30 a.m.--Transatlantic Call (WBBM): from wartime port of Baltimore, describing changes made by the war. 11:30 a.m.--Transatlantic Call (WBBM): U.S. and English nurses compare duties at service hospitals. 11:30 a.m.--Transatlantic Call (WBBM): "Bombways to London," the reactions of English men and women to robot bombs. Folks in Britain who have gained first hand knowledge of Hitler's robot bomb attacks are to be interviewed from England in the CBS trans-Atlantic call Sunday. 11:30 a.m.--Transatlantic Call (WBBM): American farmers in the war effort. 11:30 a.m.--Transatlantic Call (WBBM): "Return to France," program originating from French soil. Sunday CBS--12:30 p.m. Trans-Atlantic Call, Fifth Anniversary of War. 11:30 a.m.--Transatlantic Call (WBBM): from Carnegie Hall, musical center of America. 11:30 a.m.--Transatlantic Call (WBBM): originates in England. 11:30 a.m.--Transatlantic Call (WBBM): Louis Kronenberger, drama critic of PM, on American humor. 11:30 a.m.--Transatlantic Call (WBBM): what makes the British laugh. 11:30 a.m.--Transatlantic Call (WBBM): analyzes American efficiency. 11:30 a.m.--Transatlantic Call (WBBM): discussion of British press and radio, "How Britain Gets Informed." 11:30 a.m.--Transatlantic Call (WBBM): "How America Gets Informed." 11:30 a.m.--Transatlantic Call (WBBM): "Women in Britain," discussing changes in status during war years. 11:30 a.m.--Transatlantic Call (WBBM): portrays "An American Election." 11:30 a.m.--Transatlantic Call (WBBM): "How Britain Votes." 11:30 a.m.--Transatlantic Call (WBBM): American culture. Transatlantic Call, KOIN, 10:30 P.M., presents "Culture for Popular Consumption," a study of the business aspects of culture in America and the part played by women's clubs, book clubs, etc. 11:30 a.m.--Transatlantic Call (WBBM): "Who Are the British," discussion of various people who form the group known as the British". 11:30 a.m.--Transatlantic Call (WBBM): "Our Frontiers Never Disappear." 11:30 a.m.--Transatlantic Call (WBBM): "British Winter," as British see it--and the GI opinion. 11:30 a.m.--Transatlantic Call (WBBM): Great Britain's traditions. 12:30 Trans-Atlantic Call - British Traditions. 11:30 a.m.--Transatlantic Call (WBBM): discusses America's tendency toward doing things on a large scale. 11:30 a.m.--Transatlantic Call (WBBM): "British Cities." 11:30 a.m.--Transatlantic Call (WBBM): "Where Are You From?" depicting American tendency to move from place to place. 11:30 a.m.--Transatlantic Call (WBBM): "British Children," discussion of activities, effect of war on education and feeding. 11:30 a.m.--Transatlantic Call (WBBM): "The Theater in America." 11:30 a.m.--Transatlantic Call (WBBM): picture of Britain's Cambridge university. 11:30 a.m.--Transatlantic Call (WBBM): "Climates of America" and their effect on regional populations. 11:30 a.m.--Transatlantic Call (WBBM): "Britain and the Sea." 11:30 a.m.--Transatlantic Call (WBBM): America's sport fans are explained to the British. 45-03-18 Wisconsin State Journal - 11:30 a.m.--Transatlantic Call (WBBM): explains popular British sports to Americans. 45-03-17 Harrisburg Evening News - 12:30 Trans-Atlantic Call - British Sport. 45-03-25 Wisconsin State Journal - 11:30 a.m.--Transatlantic Call (WBBM): describes American farm life for British audience. 45-04-01 Wisconsin State Journal - 11:30 a.m.--Transatlantic Call (WBBM): "British Farming." 45-04-08 Wisconsin State Journal - 11:30 a.m.--Transatlantic Call (WBBM): explains "The American Language" to the British people. 45-04-15 Wisconsin State Journal - 11:30 a.m.--Transatlantic Call (WBBM): the British tell Americans about the "Real" English language. 11:30 a.m.--Transatlantic Call (WBBM): delineates San Francisco, host to security conference. 12:30 Trans-Atlantic Call - San Francisco. 11:30 a.m.--Transatlantic Call (WBBM): "The British Language." 11:30 a.m.--Transatlantic Call (WBBM): Presents America's penchant for hero worship. 11:30 a.m.--Transatlantic Call (WBBM): depicts role of British "pub" in English community life. 11:30 a.m.--Transatlantic Call (WBBM): tells of the American housewife and new appliances planned for post-war. 11:30 a.m.--Transatlantic Call (WBBM): tells of the British "Pub." 11:30 a.m.--Transatlantic Call (WBBM): "A Yank Comes Home." 11:30 a.m.--Transatlantic Call (WBBM): "An American In Search of an Ancestor." 11:30 a.m.--Transatlantic Call (WBBM): depicts "Independence, Mo.," home town of President Truman, with friends and neighbors of his boyhood days participating. 11:30 a.m.--Transatlantic Call (WBBM): "A Tommy Comes Home," depicts return of British soldier to civilian life. 11:30 a.m.--Transatlantic Call (WBBM): story behind American geographical names, based on Georgy Stewart's book, "Names on the Land." 12:30 Trans-Atlantic Call Names on the Land. 11:30 a.m.--Transatlantic Call (WBBM): "British Justice," tells of history of British law and courts. 11:30 a.m.--Transatlantic Call (WBBM): "An American and His Dollar," show what people do with the money they earn. 11:30 a.m.--Transatlantic Call (WBBM): an evacuated British family's return to its bombed-out home after V.E. day depicted in "Family Comes Home." 11:30 a.m.--Transatlantic Call (WBBM): depicts influence of comic strips on American life. 12:30 Trans-Atlantic Call Comics in Our Life. 11:30 a.m.--Transatlantic Call (WBBM): British gardening scenes depicted in "Gardens of Britain." 11:30 a.m.--Transatlantic Call (WBBM): depicting America at play in the summer months. 11:30 a.m.--Transatlantic Call (WBBM): "What Britain Eats." 11:30 a.m.--Transatlantic Call (WBBM): shows how American children are reared, educated, and treated. 11:30 a.m.--Transatlantic Call (WBBM): shows how average British family budgets its income. 12:30 Trans-Atlantic Call Family Budget. 11:30 a.m.--Transatlantic Call (WBBM): takes up the subject of American career girls. 11:30 a.m.--Transatlantic Call (WBBM): presents British version of career girl's problems in seeking work in London. 11:30 a.m.--Transatlantic Call (WBBM): discusses "America's First Taste of Peace." Transatlantic Call at 10:30 P.M. dramatizes an important problem of the day, "What Britain Eats." 11:30 a.m.--Transatlantic Call (WBBM): "City at the Crossroads" tells how Paterson, N.J., is meeting post-war problems. Sunday 12:30 Trans-Atlantic Call: Dream House. Sunday 12:30 Trans-Atlantic Call: Home, Sweet Home. CBS also has scheduled for Radio Week a variety of programs "reflecting the contribution of America's broadcasters to the cultural, spiritual and material well-being of the nation," highlighted by "Transatlantic Call" to be broadcast from England Nov. 4. 11:30 a.m.--Transatlantic Call (WBBM): "The World's Family," dramatic recital of radio's role in bringing people of world together. 11:30 a.m.--Transatlantic Call (WBBM): plans and problems of British people. 11:30 a.m.--Transatlantic Call (WBBM): "Going Out Into the World," story of GI facing the peace. 11:30 a.m.--Transatlantic Call (WBBM): readjustment opportunities for British veterans in "Out Into the World." 11:30 a.m.--Transatlantic Call (WBBM): tells of American post-war life. 45-12-01 Harrisburg Evening News - Sunday 12:30 Trans-Atlantic Call: South Revisited. 11:30 a.m.--Transatlantic Call (WBBM): British life and customs through the eyes of a typical English family. 11:30 a.m.--Transatlantic Call (WBBM): depicts man-made changes made in physical feature of U.S.
Sunday 12:30 Trans-Atlantic Call: 25 December St.
11:30 a.m.--Transatlantic Call (WBBM): "Happily Ever After," depicting American marriage customs. 11:30 a.m.--Transatlantic Call (WBBM): tells of British life, customs, and habits. 11:30 a.m.--Transatlantic Call (WBBM): "An Apple a Day," mirroring America's health and well-being. 11:30 a.m.--Transatlantic Call (WBBM): tells of average Englishman's attitude toward health. 11:30 a.m.--Transatlantic Call (WBBM): methods and activities of British police. 11:30 a.m.--Transatlantic Call (WBBM): "Weekend in Town," tells of visitors to New York. 11:30 a.m.--Transatlantic Call (WBBM): tells of British family's weekend in post-war London. 46-02-16 Harrisburg Evening News - 12:30 Trans-Atlantifc Call: Week End in Town. British Bride In the U.S.
Sunday 12:30 Trans-Atlantic Call: British Bride in U.S.
11:30 a.m.--Transatlantic Call (WBBM): "An American Abroad," tells of GI who remains in England to write. 11:30 a.m.--Transatlantic Call (WBBM): takes up American concept of love, as deduced from advertisements, literature, and popular entertainment media. 46-03-17 Harrisburg Evening News - 12:30 Trans-Atlantic Call: Concept of Love. 11:30 a.m.--Transatlantic Call (WBBM): reports on British concept of "Love." 12:30 Trans-Atlantic Call: British in Love. 11:30 a.m.--Transatlantic Call (WBBM): dramatic presentation depicting tendency of Americans to try to improve themselves. 11:30 a.m.--Transatlantic Call (WBBM): dramatization of Britain's problems of revitalizing production by cooperative effort. 12:30 Trans-Atlantic Call - One for All. 11:30 a.m.--Transatlantic Call (WBBM): "Congressman's Day." 46-04-14 Wisconsin State Journal - 11:30 a.m.--Transatlantic Call (WBBM): "Springtime for John Bull." 11:30 a.m.--Transatlantic Call (WBBM): closing broadcast, "Goodbye and Hello," originating both in New York and London. 12:30 Trans-Atlantic Call: Goodbye and Hello. Three new programs will be heard on KMBC this week. Yours Sincerely, a C.B.S.-B.B.C. exchange series will replace Trans-Atlantic Call at 10:30 o'clock this morning. Ronald Colman and Jane Wyatt in Frank Capra's Lost Horizon (1937. Poster illustration by James Montgomery Flagg of 'Uncle Sam' illustration fame. Ambitious young Ronald Charles Colman was serving as an office boy in 1908 with the British Steamship Company while performing with the Bancroft Amateur Dramatic Society. In 1916 he debuted on the London Stage. In 1919 he enjoyed his Film debut in The Toilers. And in 1920 he emigrated to America, soon after appearing in various stage roles, including a small part with George Arliss in The Green Goddess. He was chosen by Lillian Gish as leading man in the films The White Sister (1923) and Romola (1924). 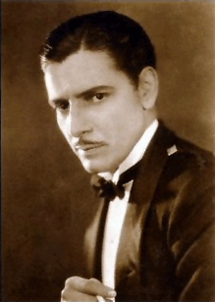 In 1924 he was invited to Hollywood by Samuel Goldwyn. By the early 1930s, Colman's star status is virtually assured when Samuel Goldwyn permits Colman the luxury of appearing in only one film per year. 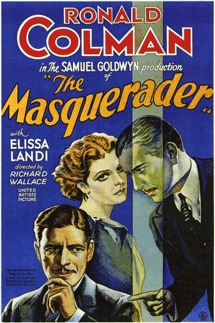 Jealously protective of his own image and reputation, Colman felt compelled to sue the Goldwyn Studios in 1933 over false rumors of Colman drinking on set during the making of The Masquerader. 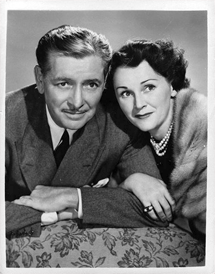 The 1940s marked the beginning of Colman's work on Radio, including numerous repeating guest spots with wife Benita Hume on Jack Benny's program, several drama anthologies, numerous patriotic appeals both in America and abroad, several retrospectives of his own Film triumphs and innumerable appearances as himself, or as a couple with his wife, Benita Hume. 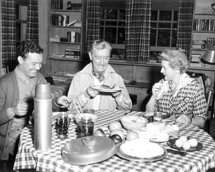 Colman also had several of his own Radio programs, among them, Everything For The Boys (1944) for Autolite and The Halls of Ivy (1950-52) with his wife Benita Hume. The Radio version of The Halls of Ivy was a Peabody Award winner. The Halls of Ivy was also chosen the Best New Radio Show for 1950. 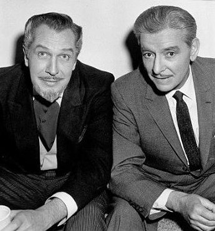 The Colmans spun the Radio version into a Television series that ran for two years from 1954 to 1955 and also garnered honors as Best New Television Show for 1954 . According to director George Cukor, "Colman knew more about acting for the camera than any actor" he'd ever worked with. For Colman fans, this does not come as a revelation. From Ronald Colman's earliest film triumphs you can see that it's not the camera that loves him. It's Colman's native, effortless ability to place himself in the optimal position before the camera that delivers his characterizations most effectively. For three generations of Film fans, Colman's suave, debonair sophistication served as a pattern of behaviour, carriage and dress they could quite comfortably and confidently emulate to great effect--and the women of America couldn't have been more grateful. Throughout Colman's entire life, his quiet, soft-spoken delivery set an entire new standard for the roles in which he was cast. As counter-intuitive as it seems, that very soft - spokenness made Colman's patented delivery all the more effective. Why? Look at the lessons of early Radio. Both before and after the circuitry innovations that dramatically cleared the airwaves of the pops and spits and rasps that had made radio listening such a challenge, the art of listening to Radio became an acquired skill. And yet once that skill was acquired, the art of listening to anything -- Radio included -- became a valuable skill indeed. Colman's secret was understanding the natural tendency to listen even more intently to quieter or more subtle aural passages to grasp their full nuance or meaning. 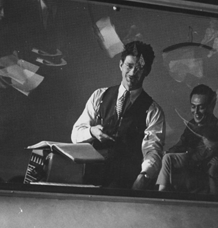 That's precisely the technique that Ronald Colman employed to make his own softer-spoken deliveries even more subtle and effective to the observer or listener alike. Some might say there's a lesson there to be learned as it might apply in the business world as well. It wasn't simply Colman's beautifully modulated voice, either. As Cukor pointed out, Colman could accomplish a great deal more by forcing the viewer to follow Colman's most subtle movements, just as he forced them to follow and listen to his voice. Colman wasn't limited to specific roles by any means. He played swashbucklers and rogues and lovers and heroes and thinkers and 'everymen' with equal effectiveness. Even when cast in a role which requires the viewer to suspend disbelief even more than usual, it was never that much of a stretch. 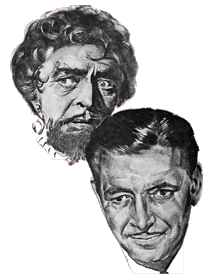 Everyone was pulling for Ronald Colman. Everyone was willing for Ronald Colman to be anyone he chose to be in Film. That's far more than sympathy or empathy. Colman's singular gift was his almost effortless ability to convince his severest critics that he could be and would ultimately become anything or anyone he was set to portray. Ronald Colman had no problem transitioning to talkies. Indeed, Colman's first sound film, Bulldog Drummond (1929), garnered him an Academy Award nomination. Watching Colman as Drummond begs the question of why he didn't go on to an entire series of Bulldog Drummond adventures. He was a natural in the role. But then he was also a natural in Raffles (1930). Bulldog Drummond was instructive on several levels. The Bulldog Drummond characterization is predictably madcap and frenetic, yet Colman adapted well to it. Colman's athleticism in the role seems quite natural and more reminiscent of Douglas Fairbanks, the senior. The snappy dialogue is delivered just as crisply and effectively as any actor of the genre, including George Sanders, Warren William, William Powell, or Basil Rathbone. In short, one wonders if a Colman-acted Bulldog Drummond franchise might not have been the early equal of Sean Connery's triumph as James Bond. Be that as it may, Colman chose what were the best roles for his career quite wisely indeed. Had he reeled off a series of Bulldog Drummonds we might have been robbed of his marvelous performances in Raffles (1930), Arrowsmith (1931), Clive of India (1935), A Tale of Two Cities (1935), a reprise of Bulldog Drummond in Bulldog Drummond Strikes Back (1934), Lost Horizon (1937), or The Prisoner of Zenda (1937). 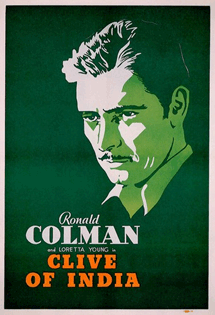 Throughout the 1930s and 1940s, Colman's sympathetic--and romantic--appeal continued to arc. Random Harvest (1942) in particular, was one of the World War II era's most popular films. Colman's appearance with Greer Garson was pure magic. A Double Life (1947), the film for which Colman received an Academy Award, is an intriguing commentary on Colman, the movie actor par excellence, who in this film plays a legitimate stage actor who becomes so immersed in the role of Othello that he is driven to murder. 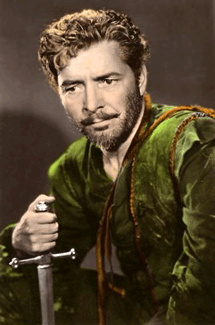 Colman, as the dashing romantic lead, is measured against one of the great tragic roles in the Shakespeare tradition. Colman taking a run at Shakespeare is tested twice in the film: on opening night, when his style is conventional (e.g., theatrical), and near the end, when Colman replays the scene in rhythms and tones that are far more cinematic--Colman's forte. The film's underlying conceit is the suggestion that Colman and other actors like him depend on their charm, wit, grace, but that they labor, sometimes even to their own detriment to be good actors. The film not only underscores Colman's star image, but provides a chance for us to see an actor at the very height of his craft; Colman's meticulous preparation and execution is apparent in even his smallest scenes. Early in the script, as Anthony John recalls how he had already come a long way with his ambition, Colman perfectly caricatures the juvenile in tennis shorts 'he' used to be, then performs a remembered scene with 'his father,' then comes back to himself as he remembers having to teach himself how to talk, how to move, and how to think. Pure Colman. Pure Genius. 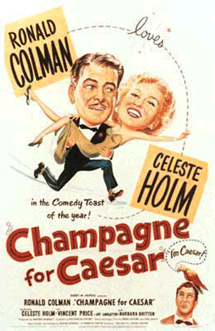 In the 1950s, Colman turned in a marvelously sympathetic portrayal of a television quiz show sensation in Champagne for Caesar. 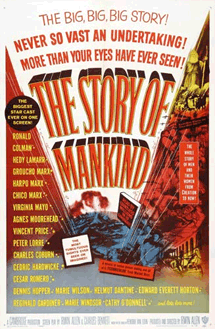 Ronald Colman's swan song in Film was--so very appropriately--as 'The Spirit of Man' in 1957's The Story of Mankind. SANTA BARBARA (INS)--Academy Award winner Ronald Colman, 67, debonair leading man of scores of the screen's most famous films, died today of pneumonia. Colman, who was one of movies' top stars for three decades, succumbed at 5 a.m. at St. Francis Hospital in Santa Barbara, 100 miles north of Hollywood on the California coast. His actress-wife, the former Benita Hume, was at his bedside when death came to end a career highlighted by such well-loved pictures as "Lost Horizon," "A Double Life" and "Under Two Flags." A friend of the family, Robert Sinclair, said the British-born actor suffered from fibrosis of the lungs, which turned into pneumonia. Sinclair said Colman had experienced trouble wtih a "low grade infection" for many years. It actually began while he was serving with the British Expeditionary forces in France in World War I. A Hollywood associate said that after the Colmans' "Halls of Ivy" television program went off the air, the actor, his wife and their daughter, Juliet, went to Europe, where his lung condition became worse. The Colmans had been planning a trip to the south of France next August. "I am deeply saddened at the news. 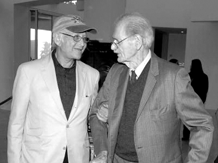 He was a great actor, a great gentleman and a great friend." His most recent film was "The Story of Mankind." Before that, he and his wife starred for several years in the "Halls of Ivy" radio and television serials. Sinclair said Colman became ill Saturday night and was taken to St. Francis Hospital yesterday. He apparently made a full recovery, but he died this morning. Funeral services will be held Wednesday at the All Saints By the Sea Episcopal Church in Santa barbara, followed by cremation. Colman was born at Richmond, Surrey, England, on Feb. 9, 1891, and began his acting career on the London stage in 1916. He came to America four years later to tour with stage comopanies and appear in New York in "La Tendresse" and "The Nightcap." His "Halls of Ivy" radio show won the George Foster Peabody award and other accolades, and he was voted the film personality who had proven most effective in radio in Motion Picture Daily's 1951 poll. 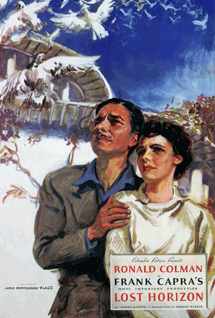 Ronald Colman lived with episodic lung pain most of his adult life. It never affected his performances. Stiff-upper-lip Brit that he was at heart, he simply soldiered on for an entire career after being afflicted with lung damage while in the service of his country during World War I. The infamous mustard gas attacks of World War I killed or maimed hundreds of thousands of soldiers on both sides of World War I. A few--the strongest in both will and character--managed to outlive their disease's inevitable--and terminal--prognosis. We're blessed that Ronald Colman was one of them.